In this Will Eisner Centennial Year, how about we get a hundred artists to draw 100 characters created by The Master Storyteller; who has inspired many of us in our comicbook art. 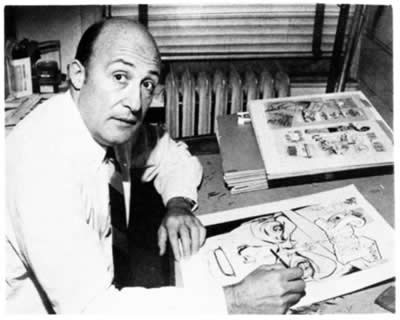 Characters created by Will Eisner have been selected for 100 artists to draw. Digital files will be submitted at the proportional size of 6.625“ x 10.25“ and will be 300 dpi. One character per artist. However, that character may be drawn by more than one artist. For instance, There are two spots for Ebony White and 8 spots open for 8 artists to draw Silk Satin. 2. A short text piece about Eisner. 4. The pin-ups or sequential pages created by the 100 artists. However, you want to pay tribute to him based on the character selected. 5. Credit pages with each artist providing name or username, country, favorite Eisner story or character, your web-site link. This will not be printed or sold. It is strictly for download by the participating artists and whoever has the link. Due date to submit completed art is September 15th. Art can be in color or black & white. Do what you are best at; drawing or painting. A Dropbox will be set-up to receive files. Start by putting in your bid for the character you want to draw in the comments below. Indicate your request by number and name. The original post will be updated as slots are filled by artists.